The retail package of the Xperia active is a real treat. To get the usual ingredients out of the way, a charger with detachable USB cable is supplied, along with a set of black in-ear headphones. A complimentary 2GB MicroSD card is inside the phone itself. The Xperia active has exchangeable rear covers and our black unit came with an extra white cover in the box. A rubber wrist strap and an arm case are also provided, as well as headset ear hooks. You've got everything you need to listen to music or monitor your progress while jogging or exercising. We were itching to test the Xperia active's water resistance ever since it first stepped in our office. Naturally, the water test is the most fun to do and we wanted to check out the wet finger tracking Sony Ericsson is bragging about. The Sony Ericsson Xperia active did a fantastic job of staying alive during the test. There was no water penetrating inside and it retained full functionality throughout. The wet finger tracking, as you can see in the video, works like a charm. The display had no problems recognizing finger commands even when very wet. The only dent in the Xperia active's underwater armor are the three capacitive buttons below the display. Once those hit the water surface they recognized it as a command and would either go to the homescreen, go back to the previous screen or open up the menu screen. But this isn't so bad, considering that most smartphones would go haywire in such a scenario. We didn't test the drop resistance of the Xperia active because we didn't want to scar that pretty face. But it does seem capable of withstanding a 1m drop. We've seen non-rugged phones survive that. We don't mean to take away from the Xperia active fame here. We are duly impressed by its underwater performance. The Xperia active is a small phone. At 92 x 55 x 16.5 mm it certainly is a little chunky, but in the same nice way the Xperia mini is. And 110.8 g it isn't a burden either. We'd call it solid rather than heavy. As a reference, the Xperia mini weighs 99 g. The splash and dust resistance have made the active a bit heavier. It’s mostly the dual back cover perhaps that accounts for the added weight. It's no hassle to slip in a pocket and is very confortable to hold. The rubbery rear is nice to the touch. It's a phone that catches the eye. The prominent "bottle opener" accent at the bottom breaks the straight lines and heightens the sporty feel of the handset. Running around the entire front is a brushed metal frame, doubled by an orange-colored strip of plastic that separates it from the battery cover. The orange accent looks great on the black case - less so with the spare white cover. The Xperia active has the same Reality display used in the mini, a LED-backlit LCD unit enhanced by Sony’s Bravia Mobile Engine. It's a 3" HVGA touchscreen with pixel density of 192 ppi. In terms of screen brightness and colors we're very pleased with this handset. On such a small screen HVGA is more than adequate - the picture is quite crisp, with good contrast. The excellent sunlight legibility is a major point in favor. Of great importance too in a device that will be much used outdoors. An interesting feature of the Xperia active's display is that it can respond to even wet fingers. So whether it's the rain or your hands are sweaty from exercise, the screen is supposed to work. Above the display you'll find a proximity sensor that disables the touchscreen during calls, and an ambient light detector. There's the usual status LED too. Unlike the Live with Walkman, the Xperia active hasn't got a secondary camera to use in video chats. Below the display is where you'll find the primary microphone and three capacitive buttons: Back, Home and menu. On the right side of the phone you'll find the volume rocker and shutter key. The volume keys are quite prominent and easy to locate by touch. The shutter key is very soft with deep half press for auto-focus. Both controls are set within the strip of orange plastic. The power/lock button is alone on the left side of the device. Unusually, there's nothing at the top of the phone. The connectivity ports are both at the bottom, where it must've been easier to secure the case against water and dust. Hidden under air-tight plastic lids are the 3.5mm headphone jack and the USB port. This isn't the most comfortable solution but one dictated by the level of proofing sought. The 5 MP camera lens and single LED flash are placed at the back of the device, alongside the loudspeaker and the secondary microphone pinhole for active noise cancellation during calls. The rubbery finish of the rear is nice to touch and fingerprint proof. Although it seems fairly resistant to scratches, there's nothing to suggest exceptional ruggedness. No grip enhancing cuts, no ribbed hard rubber frame. It's when you remove the battery cover though that the dust and water proofing claims become quite credible. Underneath is an extra layer of protection in the shape of a hard plastic lid that seals off the battery and the internals. Effectively, the Xperia active has two battery covers and the inside one is lined with rubber to fit tightly on the chassis and keep all sorts of fluids and dirt away from the sensitive parts. Under the two lines of defense you'll find the MicroSD card slot, the SIM card compartment and the 1200 mAh battery. Believe it or not, the card slot is actually hot-swappable. It's arguable though whether you can still call it hot-swap when you have to get two covers out of the way. Sony Ericsson claim the Xperia active should last up to 351h/335h in 2G and 3G on stand-by, while talk time should be 4:53h/5:31h, with about 25h of music playback. In reality our unit had to be charged daily when pushed. We'd say it did worse than the Xperia mini and the Live with Walkman that we recently tested. It was the usual workload of browsing, imaging tests and benchmarks with the phone constantly connected to both wireless and 3G. Maybe the test handset we were given had been used before or had a faulty battery. We like the Xperia active. The fact that we liked the Xperia mini too is a big part of it. We do think it was the right choice of phone to remodel as an off-roader. Some people will tell you there can't be a real rugged touchscreen phone. There may be a point in that. But they will probably have fewer reasons to doubt a 3" screen than a 3.7-incher. It makes sense we think for a durable, sporty phone to be compact. And the 3" screen of the Xperia active is proven to work. Not too comfortable for typing but otherwise perfectly OK. It's a Reality display too, with image quality that puts presumably superior smartphones to shame. 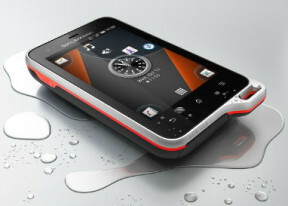 In a nutshell, the Xperia active can be the rugged smartphone to give the best of both worlds. We're about to move on to the smartphone side of it but not before we check if the proofing claims hold water.